According to explorations of MADA field research, at approximately 8:30 PM, on Monday, Al-Aqsa TV received an Israeli threat to bomb it. The TV staff quickly evacuated the headquarters and left. About half an hour later, at 9:00 PM, unmanned aerial vehicles (drones) began bombing the headquarters, where they fired five “warning” missiles intermittently. 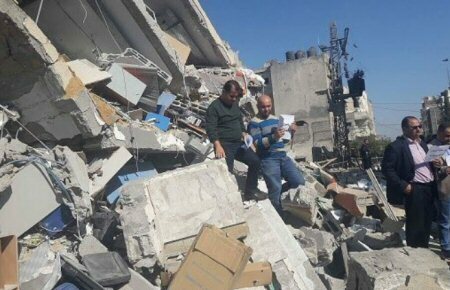 At approximately 09:15, a missile fired by an F-16 warplane destroyed the headquarters, which led to its destruction and transmission interruption. However, the Israeli warplane returned and bombed the headquarters with another missile, several minutes later, causing extensive destruction. Many houses and buildings, adjacent to the headquarters, were severely damaged. Taking into consideration the serious escalation of the Israeli occupation authorities and its army’s targeting journalists and media outlets in Palestine, MADA believes that the impunity of perpetrators of such crimes has encouraged the Israeli army to continue committing such acts in an official and blatant manner, as in the case of destroying the headquarters of Al-Aqsa TV. Therefore, MADA Center has called on the Special Rapporteur of the freedom of expression at the United Nations, as well as the international human rights organizations, to endeavor and investigate the crimes of the Israeli occupation against media freedoms in Palestine, and to bring the perpetrators, and all those involved, to justice.